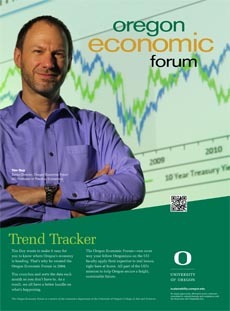 In case you missed it, save the date for this year’s Oregon Economic Forum. Although the economy remains in the midst of what will likely be a historically long economic expansion, the challenges of “poverty amidst plenty” remain. In this event we will explore different facets of equity and inclusion issues spanning from geographic to racial to gender divides and the actions that may help alleviate the economic impacts that stem from those divides. In addition, Tim Duy and Bruce McCain, Chief Investment Strategist for Key Private Bank, will discuss the economic outlook and the associated financial market implications. Keynote Speaker Heather Boushey is executive director and chief economist at the Washington Center for Equitable Growth and coeditor of a volume of 22 essays on how to integrate inequality into economic thinking. The New York Times has called Boushey one of the “most vibrant voices in the field.” She previously served as chief economist for Hillary Clinton’s transition team, and as an economist for the Center for American Progress, the Joint Economic Committee of the US Congress, the Center for Economic and Policy Research, and the Economic Policy Institute. She sits on the board of the Opportunity Institute and is an associate editor of Feminist Economics. She received her PhD in economics from the New School for Social Research and her BA from Hampshire College. Good morning. Below is the University of Oregon Regional Economic Indexes for April 2018. The release date is today, July 2, 2018. We thank KeyBank for their generous support of this project. For all regions covered by this report, both raw and moving average measures (which smooth monthly volatility) were solidly above zero, indicating an above-trend pace of activity (trend activity differs across regions). Among the employment components, weakness in the Trade, Transportation, and Utilities Employmentcomponent was particularly weak, but this appears to be a reversion of some unusually strong numbers earlier this year. The story in housing remains familiar, with a solid pace of sales in across the state yet mostly neutral to negative contributions from home permitting in most areas. The strongest permits contribution was in the Portland measure. Weak labor force growth was again a negative factor, and this indicator bears watching as slower growth in the available numbers of workers could limit the ability of firms to expand. Low unemployment rates and low initial unemployment claims supported large positive contributions to the measures and indicate that labor markets are strong and likely to remain strong in the months ahead.